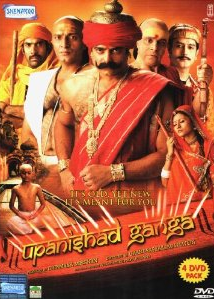 Episode #19 of Hindi TV Serial Upanishad Ganga starts a 3 episode series on 16 Samskaras. Samskar or Samskara is a broad word and it include many other things in addition to characteristics, embodiment and more. Each samskara should do (ideally) human embodiment of purification in one’s life. The makers have decided to explore each of 16 Samskara in very interesting way. Surdas (aka Soordas or Surdasa) was a Lord Krishna devotee. He was blind but his eye of the devotion towards Lord Krishna was quite well open. The content of the episode is staged as Lord Krishan came to understand about each of the 16 Samskara from Soordas as an enthusiastic kid and he explains the importance and details about each one to Krishna. Actually Indian way of life which is known as Hinduism is highly inherited from the Sanatan Dharma, the ultimate way of ideal living. It considers each important phase of life as a turning point of life. And each of this significant point should be respected embodied with some important stuff, which in turn can play an important part in vital improvement in the person to make him/her better human being. It starts with the Garbhadhan Samskar, the early beginning of a new human life. The way it is described is simply superb. Surdasji says that in order to invite a new Janki or Ram, Radha or Shyam in the family, a couple pays respect to the ultimate power and invites the pure soul to their family. What a height of the thought! Can you imagine any other culture so purely thinking about the incident of seeing a child in the mother’s womb?! Of course, every culture respects the incident and enjoys the moment with pure joy and respect in it’s own manner. But this happens here at a different level. A child is called a संतान in the culture. And a संतान is someone who expand the parents and family in all positive aspects. Everyone expects a child who can make his/her own life meaningful and does good things not only for himself/herself but for the entire family/society/mankind and the world. Garbhadhan Samskara is celebration of this moment. It is worth to explore in the episode how it is explained, nicely. This is the second stage of one’s life. After a child is conceived, the couple (the would be parents) pays respect to the almighty and prays god for the betterment of the child. Seeking the blessings of the elders and the God are part of almost every ceremony, and it is great to have so. Simant Samskar is also known as Baby Shower ceremony in some other cultures. It is usually head after a few months of first pregnancy is confirmed. The mother-to-be is showered with blessing and got a lot of gifts as well. The main idea is to keep her in happy mood. Because, it is a well known fact that only a happy and healthy mother can give birth to a mentally and physically healthy child. After the birth of the new born, on the 6 day precisely, the JatKarma ceremony is being held. On that day the home is cleaned up (it is good for the hygienic reasons, for both the mother and the child). The father of the child plays various Mantra in the newborn’s ear. It is a kind of starting of education. Till now the new born was not having a name, so now he or she is given a name through which he/she will be identified this point forward. After 40 days of the birth, the child is taken out of the home. On this day he/she gets showered by Sun light. As the new born’s body and muscles are now growing and are capable to face the outer environment. In addition the requirement of Vitamin D and other stuffs is also growing, so facing direct sunlight is a good option for the kid. After the child gets of 6 months; he/she is given the processed/cooked food for the first time. Of course, the food is quite light but it is surely a starting point to eating habit. After around 1 year of age the Mundan Samskar takes place. In this Samskar, the head of the baby is shaved off (usually a few hears are left as Shikha). It open a way to get new healthy hairs and allow the head to grow properly. Also a message to get good vibes and knowledge from surroundings is given to the child. KarnaVedh Samskar is performed by pinning holes in both the ears of the kid. It is then in future can be used to wear jewels there. Also it is an acupuncture which have it’s own benefits from the scientific perspective. This episode explores above mentioned 9 Samskars. The execution is very thoughtful and the conversation between Surdas and Kanhai is quite joyful. The writer shows his brilliance by putting a dialog in Kanhai’s mouth where he asks Surdas about his name. It is not to miss scene of the episode. The script is overall gripping. In addition to the conversation between Surdas and the kid, almost every ceremony is shown playing in between. This gives the viewers better idea of what it is being talked about. We personally feel that more emphasis on each samskar could have been given by covering just 3-4 Samskars in this episode. The dialogs are first rate and same for the background music. The episode mainly belongs to Ravi Khanvilkar who plays Surdas very effectively. A lot of facial expressions and gestures were required from him to play it convincingly and he doesn’t disappoint. He is simply superb here. The kid playing Kanhai is good too. The wardrobe is simple and realistic. At the same time the use of stage is done thoughtfully for various scenes. You never miss the larger than the life setups throughout the episode. The audio and video both are of the first rate quality in DVD set. The DVD set thus proves to be a valuable possession. It is a little pricey so wait for any good deal on an E-Commerce website to buy. As many of the episodes of Upanishad Ganga are available to watch for free on YouTube officially, you can take advantage of that as well. Though this entire episode is not available (officially) for free to view on Internet, there are many users who have uploaded it. Definite an episode which is worth watching. It introduces you to many customs we perform through our life knowingly or unknowingly. You will be inspired to think the logic behind each such custom and thank the thoughtful scholars who have understood the human life in such academic manner, and left the knowledge well document for us and coming generations.